Gifford is known for its outstanding medical care and its renowned Birthing Center. In 1996 we first met with the director of IT John Hackeny. It is worth mentioning that back then Windows NT was the current operating system. The hospital did not yet have email or a website. They had an AS/400 for their accounting system which was the heart of their company and reached via telnet. For over five years we were an extension of Gifford's IT department. We did a little bit of everything: building server racks, supplying servers and client PCs, designing network infrastructure, building intranets, monitoring the infrastructure, and performing preventive maintenance, and conducting training classes on Microsoft Office. We supplied hundreds of PCs cloned from custom images which utilized the hospital's unique messaging and security protocols. We also provided their first Windows servers, email system, and public website. Our managed infrastructure service included monitoring of servers, email systems, and support for user helpdesk. Client PC management was heavily automated via scripting using group profiles and NT KiXtart scripting (a 1991 state-of-the-art scripting language for Windows). We also diligently prepared GMC for the year 2000 "Y2K bug" (yes really). 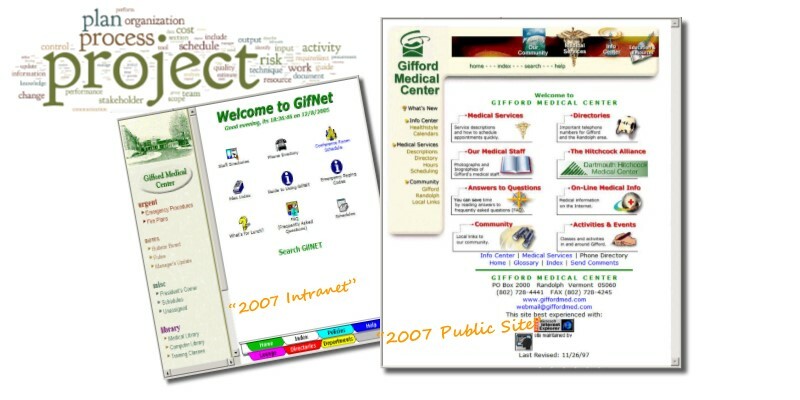 Of note is an outstanding intranet called "gifNET", which was the envy of the Dartmouth-Hitchcock alliance of hospitals (and built before SharePoint existed). It securely made available radiology reports to doctors offices electronically and saved the waiting time for paper form routing. GifNET also had dashboards to all server's health by parsing their log files. First PC network assistance with their laboratory information system. Throughout our long collaboration with Gifford Medical Center, there were many accomplishments that resulted in first systems which paved the way for later systems that followed. Amy on our help desk. Sir have you tried rebooting yet? One of the easiest ways to get to know our SharePoint consulting services is with a SharePoint health check! We can quickly review your current SharePoint farm and recommend ways to better align SharePoint with your business goals. Learn more about our services by contacting us today!